I'll be reposting old blog links here (who's gonna stop me? ), as well as new recipes and cooking tips. Yesterday I did make meatloaf and it turned out really well. Very moist and tasty, with a nice glaze on top. I've realized I do ahve some innate talent for cooking, and I quickly get a good feel for recipes with minimal need for learning. I was very nervous, really, about doign meatloaf. But it was rather easy, all things considered, and my adaptations worked very well. I think I've also developed my skills with practice. By now I can raid the fridge and apntry, and come up with a reasonable dish in short order. Next on the agenda is trying to cook deserts. I should start wih a nice, creamy cake with a filling and icing or frosting, too. The challnege is to do it low-fat and with no added sugar. the meatloaf is not low fat, as it contains ground beef and two eggs. But it is rather good. So...1 kg is about 2 lbs. I like the idea of a glaze mixed in rather than using milk like the old recipes call for. It should make it less bland. I'll make sandwiches with leftover meatloaf and they always need some A1 sauce to liven them up. But I'll dip toast in A1 if I'm out to breakfast even if I'm not having steak and eggs so I'm no judge of what needs A1 sauce. So...1 kg is about 2 lbs. I like the idea of a glaze mixed in rather than using milk like the old recipes call for. I'd say one advantage of not having formal instruction is that I don't learn to make the mistakes that are accepted as common practice. Instead I make my own mistakes ;) But, really, milk? I don't think that would go well with meatloaf, or with beef overall, unless it were mixed with other things. I know someone who injects milk into turkey before palcing it in the oven for several hours. It always comes out bone dry. It should make it less bland. Oh, it isn't bland at all. Classic Better Homes and Gardens recipe here. I have the old cookbook from before the microwave shortcuts were added to directions. There is a meatloaf recipe on packets of Lipton onion soup/dip mix, but that just makes it salty and the dehydrated onions remind me of nail clippings, so I don't use that. I don't make meatloaf often but I'd probably increase the times in the repertoire if it were tastier. I was thinking of mixing in taco seasoning since my third son is a tacoholic and I love cumin. Classic Better Homes and Gardens recipe here. 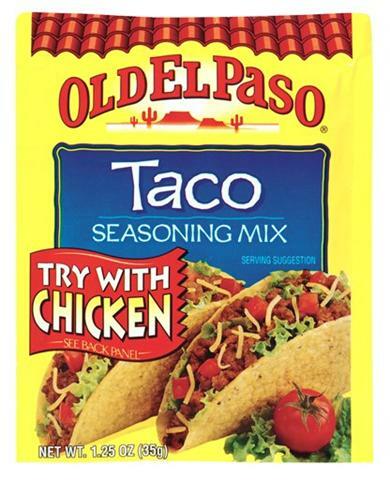 Anyway, what is taco seasoning? Mostly salt and chili pepper, with other spices. You brown ground beef or strips of boneless chicken and add the seasoning and water, then use the meat in tacos. I did cook last weekend, but I've hit a creative impasse. Or, in plain English, I coulnd't think of a new recipe and I cooked some of my "old" reliables. And I'm pretty much still stuck for next week's recipes.